These are the hotel's most comfortable accommodations. To provide you with the best experience, they come with a wide variety of essential services such as a living room, a flat screen TV and wireless internet access. Enjoy a comfortable family vacation in this spacious room with a balcony, a kitchenette, air conditioning, a flat screen TV and internet access. 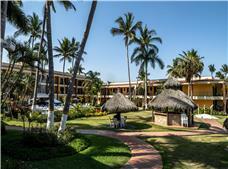 It is an ideal place to have a well-deserved rest and take in the tropical atmosphere of the Riviera Nayarit. Spend an enjoyable vacation in this spacious accommodation, which is ideal for families that look for amenities like a flat screen TV, internet access and air conditioning.